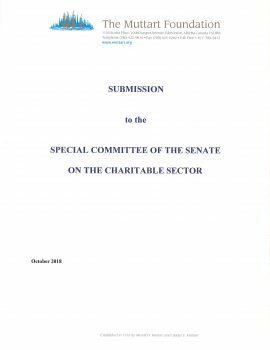 The Muttart Foundation has released its submission to the Special Committee of the Senate on the Charitable Sector. This Committee, long advocated by Muttart, is charged with examining the laws and policies that affect Canada’s charities and not-for-profit organizations. Muttart’s submission lists the most important recommendations it feels are necessary in the regulatory field, and comments on other issues that fall within the Committee’s mandate. A copy of the full submission is available here.